My boys love drawing. They draw all day long, and I keep every single one. I must say, they do a pretty good job. They come up with the cutest things. 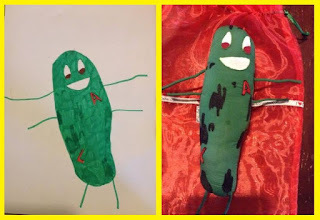 I had heard of a company awhile back that takes your childs drawing and turns it into a real life doll/stuffed animal. Honestly, I was amazed. I thought how cool would that be to have a doll that was entirely my kids creation, a one of a kind masterpiece that no one else in the world would have. I decided to reach out to a company that does it and ask them to be a part of my Holiday Gift Guide. They agreed and told me to send in my kids drawing. My 4 year old Ashton was really excited about it. He immediately drew what I call his Go-To drawing. An oval looking creature with a smiley face, 2 arms and 2 legs. It sorta reminds me of Plankton from SpongeBob, but Ashton insists his name is "Liggy", of course its Liggy, Liggy is his imaginary friend that he mentions a thousand times a day. So we will go with Liggy, Liggy it is. Liggy started his journey on a piece of white construction paper on my kitchen table. He was then emailed to the Cryoow company and handmade in Bali. Liggy was then shipped from Bali to our small town in Prestonsburg Kentucky. Liggy's journey getting to us was almost as exciting as when he actually arrived. As soon as he shipped we were sent tracking information and watched him go from Bali to Hong Kong, then California to Kentucky. I kept Liggys drawing on the refrigerator to keep the kids excited. When it arrived I was in shock at how identical the doll was to my sons drawing. The craftsmanship is perfect. I can tell that a lot of love and dedication goes into these dolls. The Cryoow dolls, in my opinion is a must have item for children. The look on their faces when they see their very own drawing come to life is priceless. Check back for a giveaway in the coming weeks. Gobble It Up Reviews received a sample for review purposes only. All opinions stated are my own and were not persuaded in any way.